The ocean view gardens separate the two districts of La Condamine and Monaco-Ville in Monaco, France in Europe. When you stand in these beautifully manicured gardens with a stunning view of the ocean you are actually between two separate districts of Monaco, France. Monaco-ville and La Condamine are two of the ten wards in Monaco, France that are divided by gardens of palm trees, ferns and flowers. The peaceful gardens are the perfect place to spend a hour or two enjoying the sunshine with a ocean view of the vast Mediterranean Sea in Monaco, France. 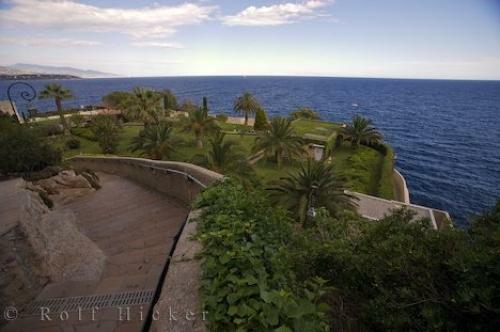 Photo of elegant ocean view gardens in Monaco in the Provence, France in Europe.